• US Dollar prices are determined by the exchange rate. • CANVAS GICLEE EDITION • Rolled £325 • Stretched £375 Limited to 30 worldwide The only opportunity to obtain a full-size reproduction on canvas of the original painting. Individually signed and numbered in paint by the Artist. Size when stretched: 36" x 24" approx. Supplied stretched on wooden formers ready for framing, or rolled ready for stretching by your picture framer. • Editions listed below: Image size 27¾" x 17¼". Overall print size 36" x 26" approx. Only 100 worldwide. Signed and numbered by the Artist. Only 10 worldwide Signed by the two Knight’s Cross holders listed above, each print has a unique original pencil drawing inscribed on it by the Artist, which can be drawn to your own specifications. 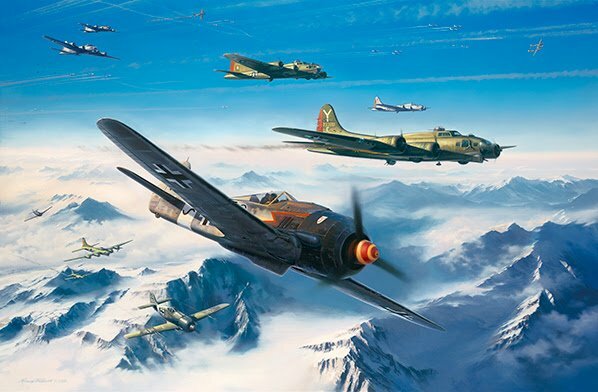 In this powerful painting Nicolas Trudgian portrays the Luftwaffe's premier 'Sturm' unit, IV. (Sturm)/JG3 'Udet', which served throughout the 'Defence of the Reich' period and the Ardennes Offensive. A number of the unit’s pilots won the Knight’s Cross whilst serving in the 'Sturm' role, including Oscar Romm, Hans Weik and the officer who led the unit on 18th July 1944, Hauptmann Wilhelm Moritz. By the war’s end, IV. (Sturm)/JG3 ‘Udet’ had amassed over 500 victories. The ‘Sturm’ concept was the Luftwaffe's response to their difficulty in shooting down the strong and heavily armed US bombers, especially the B-17. The fighter chosen to carry out the new tactic was a special version of the Fw190A-8. This aircraft was reinforced with additional armour to deflect deadly machine gun fire. It also carried the extra attacking power of two of the much-feared Mk108 30mm cannons which fired high explosive shells. The ideal 'Sturm' attack was delivered from behind, closing in to virtually point-blank range. It required nerves of steel from the pilots. This exciting limited edition also offers signatures of up to eleven Knight's Cross Aces, collected over a long period of time, many of them rare and unrepeatable.